Posted June 10, 2017 by finnfemme & filed under Fashion, Vintage. This super fab Alley Cat by Betsey Johnson ad from the August 1973 issue of Seventeen magazine epitomizes early ’70s fashions for me! This is a look I adored, with all its crazy prints and bright colors. 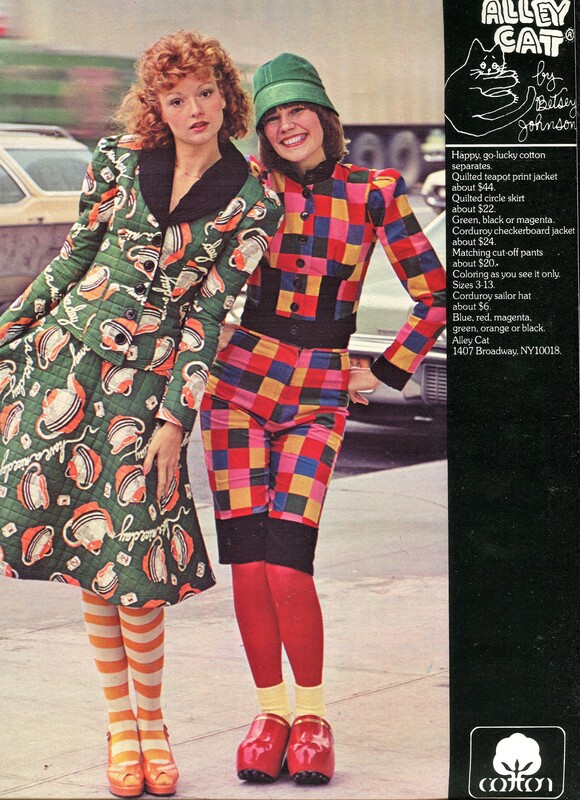 Betsey’s fashions were so fun, kicky, and a bit quirky – I loved wearing them! This ad features ‘happy go-lucky’ cotton separates. The model on the left (redheaded Sunny Redmond) is wearing a quilted teapot print jacket and circle skirt. Love her striped tights and golden platform shoes. The model on the right is wearing a cotton corduroy checkerboard jacket, matching cut-off pants, and corduroy sailor hat. She is also wearing what looks to be the iconic Famolare red wooden clogs, which were awesome. Thankful that I had Betsey’s designs to wear in the 1970s!